Vishwaroopam II is an Indian bilingual action spy thriller film simultaneously made in Tamil and Telugu. 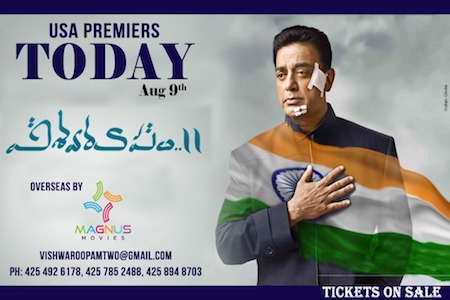 Written and directed by Kamal Haasan, it is a prequel and to the smashing hit Vishwaroopam (2013) and features himself alongside Rahul Bose, Pooja Kumar and Andrea Jeremiah, reprising their roles set to release from TODAY (August 9th, 2018) in the US. As per the distributor, all drives were dispatched to the theaters and the shows will begin TODAY (AUGUST 9th) from 3PM PST, 4PM MST, 5PM CST & 6PM EST respectively. The tickets are already on sale in many locations and only priced at $15/$10 for Tamil and $12/$8 for Telugu versions. Vishwaroopam 2, one of the much-awaited summer films of the year. The actor is leaving no stone unturned with his promotional activities and that is grabbing all the attention in the media and generating tremendous buzz and near-frenzied levels of anticipation after smart marketing that released several teasers from the movie to demonstrate how fantastic the visual effects looked and highlighted the use of long, uncut shots. Magnus Movies is releasing the film in more than 150+ locations across the country in the US. This is the biggest release yet for Kamal Haasan’s film in the country. Interested in exhibition for your local cities and/or trade inquires. Contact Magnus Movies today!